If you're a fan of DreamWorks Animation's "How to Train Your Dragon", they you need to check out this follow-up animated TV series "Dragons" if you haven't already. The first season of this show was subtitled "Riders of Berk" and included 20 episodes. The second season which just finished airing this month was subtitled "Defenders of Berk" and also included 20 episodes. This DVD is Part 1 of the second season consisting of first 10 episodes. The last time Fox released both part 1 and 2 at the same time for the first season but this time only we are only getting part 1 for now. This show is getting better and better with each new season. We have plenty more of this great franchise to come with season three subtitled "Dragon Masters" and of course this summers "How to Train Your Dragon 2″ in theaters this June. Keep them coming! Based on the DreamWorks Animation Academy Award nominated movie How to Train Your Dragon, "Dragons: Defenders of Berk – Part 1″ follows Hiccup and his fellow dragon trainers as they battle to protect their island home. The young Vikings must put their dragon training skills to the test to defeat dangerous and surprising new enemies! The series features original voice talent from the film including Jay Baruchel, America Ferrera and Christopher Mintz-Plasse and will include, Zack Pearlman and more. Here are the listings of the first 10 episodes from season 2″Live and Let Fly", "The Iron Gronckle", "The Night and the Fury", "Tunnel Vision", "Race to Fireworm Island", "Fright of Passage", "Worst in Show", "Appetite for Destruction", "Zippleback Down" and "A View to a Skrill Part 1″. Like the first season, this DVD is also jam-packed with special features that dive deeper into the exciting world of "Dragons". First up is "Dragon Tracker Part 3″ which is a continuation from the first season DVDs giving an in-depth look at the shows dragons. This one includes the Screaming Death, Fireworm Queen, Flightmare and Skrill dragons. "Evolution of Screaming Death" is a featurette with visual effects supervisor David Jones talking about its history. Lastly there is also a "SuperFly" Dragon Mash-up music video. I feel like a game show host…but "Wait there's more…" Along with the purchase of the DVD you will also get a Digital HD UltraViolet code, which is a nice bonus personally to be able to watch these episodes on the go. There is also an offer for exclusive battle gear and one month's free subscription to School of Dragons, the online game from JumpStart based on DreamWorks Animation's How to Train Your Dragon franchise. This game rules and is a must play for any fan of the franchise. Not only does Defenders make the wait to June far more bearable but it also provides your children with quality entertainment they can enjoy and learn valuable moral lessons from along the way. 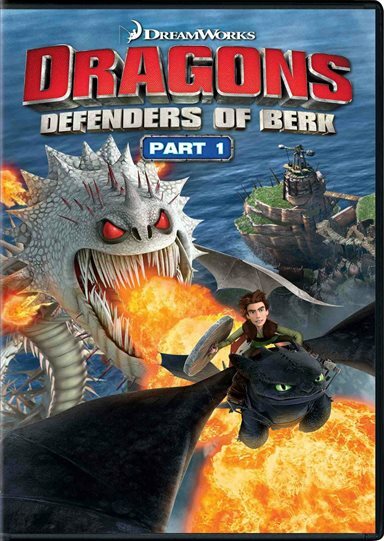 For more information about Dragons: Riders of Berk visit the FlickDirect Movie Database.